Great post.. I love hearing about lady lifters! And yes – so true that you can totally sweat it out from a good heavy lifting session! Excellent and succinct article, I wish you’d write more, for example sharing the experiences of your courses. Hello Kyle! Thanks, what would you like to know? Are you talking about my experience of doing the course, or the experiences of people who have done it? Many PTs like myself, often we feel… well, after the first 6 or so weeks, in most (though not all) cases, basically the person knows what to do, they don’t need one-on-one attention 100% of the time, just the occasional tune-up and applying brakes or accelerator as necessary. Ideally, people would be one-on-one for at most 6-12 weeks, and after that would move to small group training more loosely supervised. That’s interesting, Kyle. I find that clients need a lot longer than 6 weeks though! Perhaps it’s a different type of client. Where I work (upfitness.co.uk) we get people who have all sorts of movement restrictions and difficulties, don’t know much about training and are new to concepts such as tempo, muscle tension and explosive muscle contraction. Proprioception and motor control can be very poor; people can be unable to even tell you where their glutes are, let along contract them properly! Hip hingeing is a big problem, especially with men. People who have never trained have no neuromuscular stimulation and it takes a while sometimes to open up those pathways. In addition to training, clients often need a lot of help and hand-holding with their nutrition. But, assuming that some clients are competent after 6 weeks, I think small group training is a great idea. I am starting to do this for Ladies Who Lift graduates. 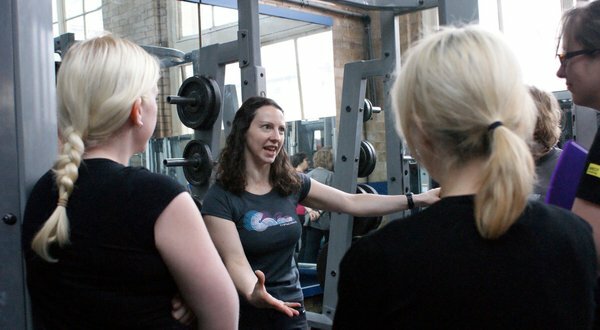 The difference is that Ladies Who Lift is a standalone course for people who are training on their own or want to- it’s not designed for people who are used to personal training. I do get people who have had personal training but generally it is people who want to do things under their own steam. I mean, 6-12 weeks to get the basics, so they can get to a level of strength and mobility sufficient for everyday life. For a typical young woman with a full-time job and some sports, I’d put that at something like a 60kg squat, doing a chinup or two, an 80kg deadlift, that sort of thing. We might add 40kg to the lifts for the typical young man. Tempo and the like aren’t necessary for that. And they can have a couple of injuries or movement restrictions and still get those basics. Certainly they can go further and do barbell snatches and so on, but for everyday life and recreational sports, they don’t need to. Really, people can always go further with things, of course. But there’s a “just enough to be going on with” level. It’s certainly open to argument exactly where that is, of course. But really this is the sort of thing it’d be interesting to see you write about at length. Your top 4 weightlifting concepts are spot on…particularly tempo. I’m nearly 50 and have been lifting and strength training seriously for about a year (mainly powerlifting). Many people rush resistance exercises, not getting the most out of the movement,developing bad habits and therefore risking injury. It’s MUCH harder, both technically and physically, to lift/lower a weight slowly and with control. You are absolutely right about the quality of weight training improving when considering tempo. It’s all about the technique, not about the strength…just because you lift heavy one day, doesn’t mean you’re stronger – it just means you lifted heavy that day! Keep up your great advice – I’ll be spreading the word. Thanks so much Julie, good to hear from you. i never knew about the “movement not muscle” technique. Sally you ‘re such a gift. thanks for correcting me. I’m sure they’ll be benefioted from this site. I think a big mistake for beginners to start workout in a gym without a personal trainer. Without basic knowledge, definitely, you can damage your health! Train with the mind! Thx for sharing a helpful review!